President Barack Obama is either extraordinarily politically tone-deaf or arrogant beyond bounds, as indicated by his relentless pursuit of policies strongly rejected by the American people. His decision or acquiescence in the Department of Justice's decision to reinvestigate CIA terrorist interrogators is the latest outrage. Obama's approval ratings have cratered even further since my most recent column, and he's either Mr. Magoo, driving along in blissful oblivion, or Fearless Leader, who will do what he wants, American people be damned. Based on Obama's oft-articulated mindset -- "I won, so the other side should just quit talking" -- I think it's safe to say he's closer to dictator than to Magoo. Besides, Attorney General Eric Holder's decision to begin a new investigation of the CIA interrogators has Obama's national security-emasculating fingerprints all over it. Obama has been railing against alleged "torture" of terrorist detainees since early in the presidential campaign. He has endlessly apologized for American "imperialism," even going so far as to castigate our policy toward Iran of more than three decades ago, but giving that mullah-run state a pass for its egregiously hostile policies and behavior toward us. On top of this, Obama is closing Gitmo with no plan to relocate the dangerous prisoners; he has directed that many of these terrorists be tried in civilian courts; he's abandoned the term "war on terror" in favor of "overseas contingency operations"; his administration has ordered that captured terrorists be Mirandized on the battlefield; and he's now going to further weaken the CIA by reassigning terrorist interrogation duties to an interagency entity operated out of the White House. What more evidence do we need that this decision is Obama's handiwork? "Heavens, no," say his defenders. "Obama is to be commended for distancing himself from the Department of Justice, which has finally achieved some independence, unlike during the Bush years." Eric Holder, they say, is being guided by the law, not politics, and Obama is choosing not to intervene, despite his earlier promise that he would "look forward and not backward" with regard to the CIA torture issues. Nice try, but Obama chose Holder precisely because he shares Obama's worldview. Obama might feign detachment from this decision, but the American people aren't nearly as gullible as he thinks, as witnessed by their informed vocal opposition to his Obamacare scheme. 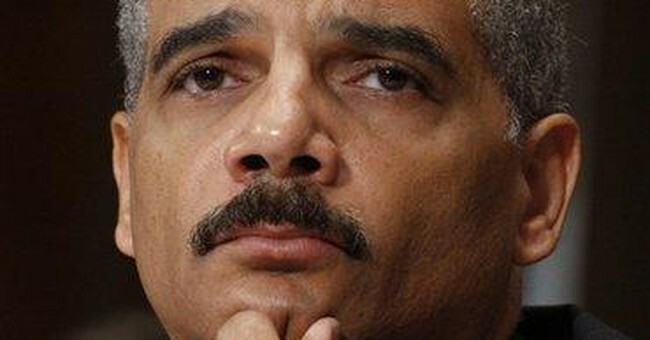 To suggest that Eric Holder is not a political animal is laughable. Just consider, among the litany, his instrumental role in the pardoning of Marc Rich, his decision to dismiss an already-won case against New Black Panther Party members for voter intimidation activities, and his decision to get a second opinion from the Office of Legal Counsel on his own Justice Department's apolitical decision that granting voters in the District of Columbia a voting representative in the House would be unconstitutional. Even more telling than Holder's MO of selectively putting politics above the law is his decision in this case, which reeks of politics and not blind justice. The Justice Department already conducted a thorough review of these dozen or so cases and, with one exception, affirmatively concluded that they should not be prosecuted. In its "declination memos," the department stated that there was "insufficient evidence of criminal conduct; insufficient evidence of the subject's involvement; insufficient evidence of criminal intent; (and) low probability of conviction." Jennifer Rubin, for The Weekly Standard, reports that many former Justice attorneys stated that the federal prosecutors who reviewed these cases "were seasoned professionals" who would have blown the whistle had political appointees pressured them. Another former Justice lawyer said that a new prosecution would probably encounter "an insurmountable problem" unless "new facts" emerged. Yet as Rubin notes, there's no hint that Holder has reviewed the former task force's findings or conducted interviews himself. Adding insult to injury, Holder has delegated the task of second-opinion making to the Office of Professional Responsibility, which is an odd choice to conduct an investigation of non-lawyer CIA agents because its job, as Rubin observes, is to oversee lawyers' professional and ethical conduct. The question of whether to prosecute the interrogators has been asked and answered by career professionals, who insist Obama couldn't get a conviction if he were to decide to prosecute. If Obama proceeds with this outrage on top of all the rest, he might just secure approval ratings so low that even ACORN and the New Black Panthers won't be able to gerrymander and intimidate his party to victory in 2010.